A driver who had taken cocaine ‘barged into’ a police car as he drove along the pavement to get past it during a high-speed chase through residential areas of Warwick. But despite the ‘shockingly dangerous’ nature of his driving, Thomas Mann escaped being jailed when he appeared at Warwick Crown Court after pleading guilty to dangerous driving. Mann (22) of Stratford Street, Warwick, who also admitted driving with specified drugs in his system and having no licence and no insurance, was sentenced to nine months in prison suspended for two years. He was banned from driving for three years and ordered to do 150 hours of unpaid work and to take part in a rehabilitation requirement for 20 days. Prosecutor Scott Coughtrie said that at shortly after midnight on October 16 last year a police officer in St Michaels Road, Warwick, saw a Vauxhall Astra which had been reported as being driven fast. When he began to follow the car there were three occupants, but he lost sight of it, and when he saw it again in Wilmhurst Road, Mann had dropped off one of his passengers. As the officer followed the car to Birmingham Road he carried out a check which showed it had no insurance, so put on his blue light. Mann stopped, and the officer pulled up behind the Astra and got out to speak to him. But Mann then accelerated away harshly, with the wheels spinning, setting off a pursuit which lasted around 20 minutes. 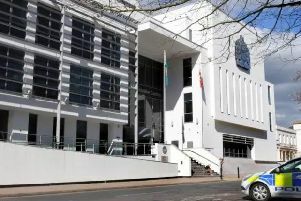 After driving along Theatre Street, he headed down West Street and into Stratford Road at speeds of up to 80mph in the 30 limit before turning into a housing estate where he went over speed bumps at 40. The chase was taken over by police pursuit driver Pc Mark Savage whose in-car camera recorded Mann doing 70mph as he drove along Alders Grove and Stratford Road. Pc Savage managed to overtake the Astra and pull in front of it to force it to slow down. “But the defendant was weaving from side to side, trying to get past the police officer. He went up onto the pavement to get past, and barged into the police vehicle before speeding off,” said Mr Coughtrie. But other officers ahead of him put down a stinger, and after going over it Mann continued to drive for some time before coming to a halt. He got out and ran off, leaving his female passenger in the car, clearly very upset by what had happened, but was caught a short distance away and arrested. A blood test at the police station showed that Mann, whose only previous conviction had been for travelling on a train without a ticket, had cannabis and cocaine in his system. Nick Devine, defending, said: “This behaviour could not be any more out of character. Mr Mann is normally a responsible young man who holds down a job. “He has responded to what happened. He’s not taking drugs, and he’s not driving. He’s going everywhere by bike or on foot, and he cycled to court today. Mr Devine said Mann had bought the car a couple of days earlier, but could not afford to insure it, and ‘sheer blind panic took over’ when the police indicated for him to stop. He added that Mann will now lose the car because it is still impounded by the police and he cannot afford the charges to get it back. Sentencing him, Recorder John Freeman told Mann: “You are only 22, and you have clearly got a lot of growing up to do. “You don’t need me to tell you, you drove in a shockingly dangerous way. You lost your head when you saw the police, and took off, and it was only by chance you were stopped by the police without any further harm.